Pat Ellsworth was diagnosed with Myasthenia Gravis as a teenager, and the Myasthenia Gravis Foundation of America was founded by Jane Ellsworth in 1952. George Reeves served as national spokesperson in the mid 50s.Through the years, the readers of The Adventures Continue magazine and website have donated nearly $16,000 to Myasthenia Gravis. 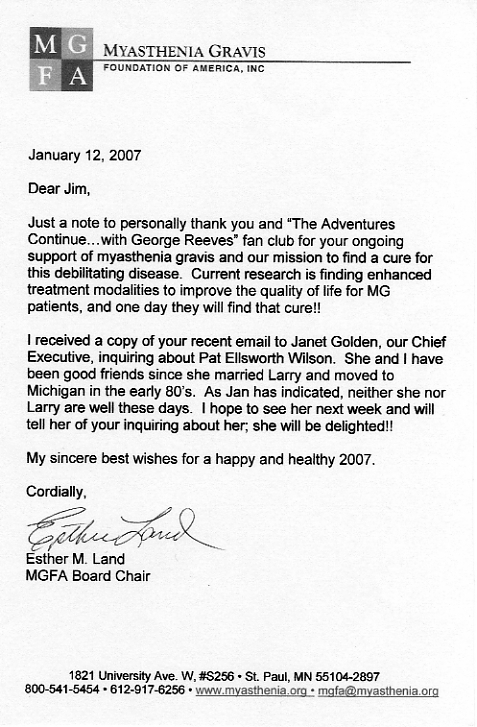 The letter shown below was sent to me from Esther Land in January, 2007, soon after I forwarded donations in George's name from Dave Orbach, Mike Goldman, Gail McIntyre, Jody McGhee, Mandy Owens, Carl Glass and Harvey Gilmore. The names of previous contributors can be found here and here. That way I can update the website total whenever a new donation is made.